We have been steaming along on one engine for the past week and a half on our way to Nawiliwili (Kaua'i) to make a timed arrival at our birth. We steamed as slow as we could given that the evaporators need a minimum amount of waste heat from the engines to make water (we make all our own potable water on board from sea-water, it is pretty clever using a vacuum and waste heat generated from the main engine we can get fresh water from sea water almost for free), but still we are two days early to port. To kill time and because anchoring is nearly impossible since the sea floor is as steep as the sides of the mountainous islands we are drifting south of Kaua'i and west of Ni'ihao. At our slow speeds en route to Hawaii we have been dragging lines hoping to catch some fish. For about 2270 nautical miles we have caught nothing, but today while the sun was lowering over Ni'ihao and Kaua'i was a fading gray silhouette to the north the fish started to bite. The first fish was thrown back for good luck, and it must have worked since the next fish was a wahoo and a big one too, almost 70 pounds. The Second Assistant, Rob, hooked it and started hauling it in on a hand line, then 8x2 A/B, Mike gaffed it and helped haul it over the stern. 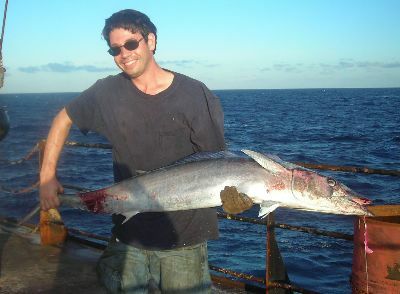 The fish was tired from the fight of hauling it in, but still had a little fight left in it as it thrashed about on deck, fighting back when the hook was pulled from its mouth. This fish looks like a mackerel only about four and a half feet long and just as silvery blue minus the yellow, a beautiful fish. A bash to the head didn't quite finish the fish so a stab and a twist deep into the brain through the eye and it was dead. Then Rob cut behind the pectoral fins down along the spine and up along the belly then slicing here and there peeled back a three and a half foot fillet, then another front he other side while the cook was sitting on a bit near-by in armament at the size of the fillets being pulled off that fish We will probably be eating it tomorrow night for dinner, and perhaps the next night too, this fish has enough meat to feed the crew at least twice over. While this fish was being hauled on board I was imagining the seafarers before refrigeration who might have taken a month or better to make Hawaii, catching fish or bringing livestock to slaughter would be the only source of fresh food. By comparison we have it easy today; we have freezers full of ice cream, and fish, and refrigerators full of fresh fruit, vegetables, eggs, milk, cheese, etc. Even the spinach is still mostly fresh and crisp, though a black leaf will be found here and there. Every day and every meal there are three entries, and every morning omelets, at lunch and dinner a salad bar is set out. Some items in the salad bar are starting to show signs of age; some of the cherry tomatoes are turning black near the stem, the carrots are starting to crack, all we have left for lettuce is iceberg - the red leaf ran out soon after leaving the west coast, and things like cucumbers, and bell peppers are in short supply. While the fresh food on the ship doesn't stack up to what you would get shore side, I'd bet it is a whole lot fresher than what might be had out her a hundred years ago.